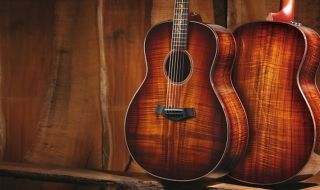 Musikmesse 2013: Taylor has revealed the latest addition to its Grand Orchestra range, the all-Koa K28e. Launched at NAMM earlier in the year, the Grand Orchestra is a new body shape from Taylor, and the K28e joins the existing 518e, 618e and 918e. Like other Grand Orchestra models that have been introduced this year (the 518e, 618e and 918e), the K28e makes its debut with a special release of 100 First Edition models. In addition to the beautiful wood-rich appointments that characterize other Koa Series models — Indian rosewood binding, a rosewood and maple rosette, and Island Vine inlay — premium touches include AA-grade koa and tone-enhancing Adirondack spruce bracing. Each First Edition model K28e comes with a custom label and ships in a Deluxe "First Edition" hardshell case. Once the guitar is registered, the owner will receive a custom GO First Edition guitar strap, a numbered certificate of authenticity, and a special commemorative booklet. All models are equipped with Taylor's proprietary Expression System® acoustic electronics. The K28e will eventually become a standard model with the Koa Series.